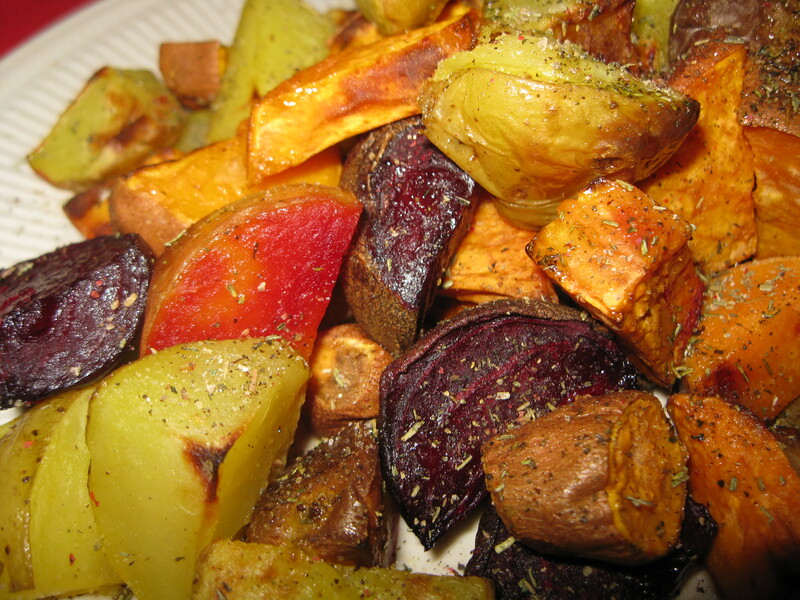 Potatoes & Yams & Beets, oh My! Roasted Fall Vegetables are some of the easiest and most delicious autumn dishes to make! Ayurveda recommends using nightshades like potatoes seasonally and in moderation. In this medley, waxy small white potatoes, sweet potatoes and beets are mixed together with some peppery spices to balance out and lighten the kapha quality of “guru,” meaning “heavy” in the starchy potato. This dish provides high levels of Vitamins C & A and the mineral Manganese, which is an important trace element concentrated in the bone, liver, pancreas and brain. Cut up your favorite potatoes and root veggies, add some ghee or olive oil, herbs de provence, 1/4 tsp garam masala or curry powder, salt and pepper and roast 425F for 30-40min. Enjoy! ← Ginger Agave Syrup Pears! looks delicious and facebooked it !